Aiming to become a community anchor with the capacity to unite theater professionals, students and local residents of all ages, New Haarlem Arts Theatre, the professional theater company of City College of New York (CCNY), will present its first play for young audiences, “Flying Fables,” adapted by Obie-winner Stephanie Berry, directed by John-Martin Green with choreography and staging by Bruce Hawkins, and original music by Patricia Ju from July 14 to 27, 2012 at Aaron Davis Hall, 135th Street and Convent Avenue. The play is a modern, urban fairytale about a young ambitious couple, Marie and Charles, who are in flux in their marriage. Waking one morning to a common dream, they follow the dream’s instructions to search for a trunk which they believe holds the key to their happiness in the tunnels of the subways. They are transported into the magical world of fables where they are ushered through a series of tales (from Africa, Asia and South America) by their childhood alter-egos. As the moral of each story unfolds, the main characters experience powerful revelations. Using drama, music and movement the performers bring fresh interpretations to traditional fables. A race between a hedgehog (Serge Thony) and a hare (Maggie Lally) is observed by the other animals. (LR) Danyel Fulton, Chanel Jenkins, Michael Anthony, Barron Bass, Kristin Adele. Photo by Jonathan Slaff. John-Martin Green (director) is Co-Founder and Co-Artistic Director of Blackberry Productions and for over twenty-five years, has created original theatre that reflects untold stories and history of African Americans. He has used the arts in schools and community-based-organizations to nurture the cultural health of communities. He has directed “The Rootwoman” by Michael Bradford at Harlem Stage, “Three Sisters,” “Willie’s Cut & Shine,” and “A Different Flava” at Ensemble Studio Theatre, “The Hand that Slapped Kate” at Bay Street Theatre and “Spiritual Journey” at the Apollo Theatre. He has taught Theatre at New School University, SUNY, Nassau Community and Old Westbury Colleges and at Brooklyn College. He holds a BFA in Drama from Bard College and an MFA in Theatre Directing from Brooklyn College, and is a member of Ensemble Studio Theatre. Bruce Hawkins (choreographer) received the AUDELCO Black Theater Achievement Award for Outstanding Male Musical Theater Performance for his song and dance work in the New Federal Theater production of Melvin Van Peebles’ musical play about Bessie Smith, “The Champeen,” in which he played ten different characters with 27 costume changes. He has been on the professional dance faculty of the Alvin Ailey American Dance Theater for several years. He has also taught ballet, modern and jazz in private dance studios and been an adjunct professor of dance and guest artist at SUNY Purchase, NYU, Adelphi, Lehman College for the Performing Arts and University of Washington. The actors are Kristen Adele, Michael Anthony, Barron Bass, Craig Dolezel, Danyel Fulton, Chanel Jenkins, Maggie Lalley and Serge Thony. Original music is by Patricia Ju. Stage Management provided by Got Cha Back Productions. New Haarlem Arts Theatre (NHAT) (www.newhaarlemartstheatre.org) aims to become a professional theater uptown that ranks among the best in the country and to produce bold theatrical works that express the true history, culture, and diversity of America. Under Eugene Nesmith, founding Artistic Director, a management team was formed last year to build and sustain a vibrant cultural institution in partnership with CCNY to offer a home for a professional theater company in which emerging professional actors from the CCNY community work alongside veteran artists of distinction. NHAT works to unite students and local residents in a range of programming that addresses the professional and educational aspirations of the unique and culturally essential neighborhood that is Harlem. Productions encourage artistic freedom, risk taking and bold experimentation with theatrical forms. 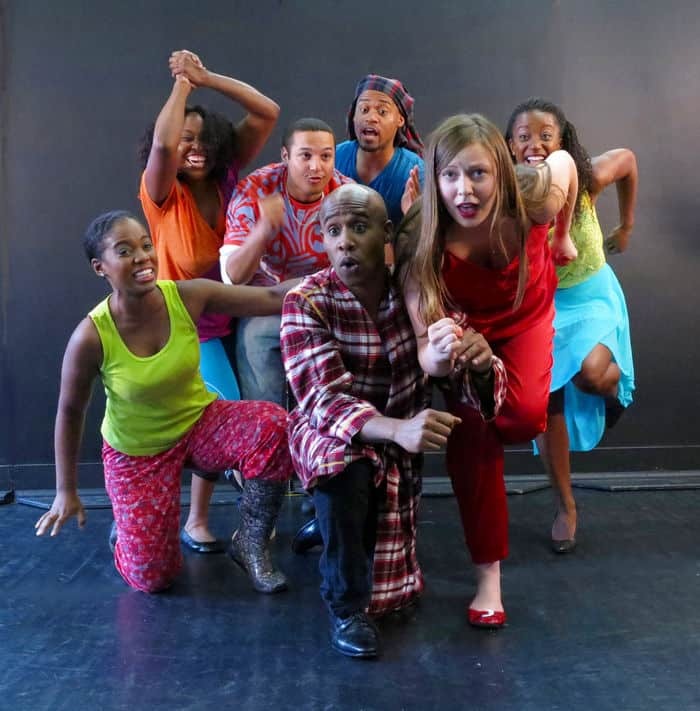 NHAT also strives to attract audiences from around the City to Harlem again. Last summer, In its inaugural season, New Haarlem Arts Theatre produced “Blues for Mister Charlie” by James Baldwin, directed by Eugene Nesmith, and the musical, “Ain’t Nothin’ But The Blues,” directed by Alfred Preisser. Both productions had casts that mixed New York professionals with recent graduates of the CCNY theatre department and student actors. The shows were roundly praised by critics and audiences alike and the company was recognized as an important contributor to the culture of our city and an excellent platform to launch careers for students in the CCNY theater department. Its production of “It Ain’t Nothin’ but the Blues” was honored with three AUDELCO Awards for Excellence in Black Theatre: Musical Production of the Year, Best Director (Alfred Preisser) and Best Choreographer (Tracy Jack). The production was extended one week in order to share it with a wider audience, but regrettably, the added performances had to be canceled due to Hurricane Irene. This summer, the theater is entering its second season at Aaron Davis Hall, located at W. 135th Street and Convent Avenue, Manhattan (Hamilton Heights). “Flying Fables” will be its only family theater offering this season. There are three offerings for general audienes. “Ma Rainey’s Black Bottom” by August Wilson, directed by Eugene Nesmith and starring Johnnie Mae as Ma, will be presented June 14 to July 8, 2012. “Sweet Charity,” with music by Cy Coleman, lyrics by Dorothy Fields and book by Neil Simon; originally conceived, staged and choreographed by Bob Fosse, has been re-conceived as a Latina’s story by Julio Agustin, who will direct it July 26 to August 19, 2012 with choreography by Lainie Munro. A readings series, “Unheard Voices for the American Theater,” curated by Rob Barron, will be held June 18, June 25 and July 2, 2012.